Dazzling solitaire diamond pendants complement every piece of clothing—from denim to black-tie. Refined or regal, the message conveyed by these pieces is entirely up to the woman whose neck it adorns. Resting near the collarbone, the pendant passionately purrs. Dangling lower, the same necklace can command an authoritative respect. 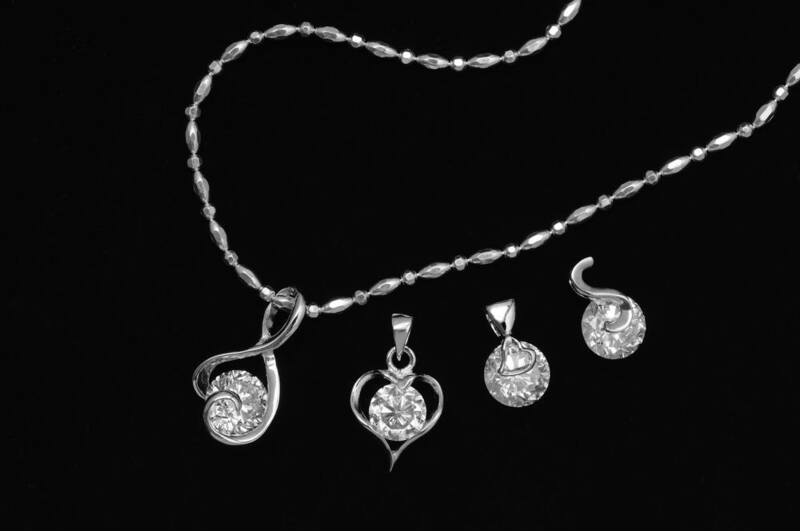 Diamond pendants are classic and classy. Never boring, never overdone, diamond pendants are the perfect gift and one of the most wearable pieces of jewelry. While the choices in pendants and pendant designs can seem endless, each diamond shape within a design speaks to a different woman. Round brilliant diamonds are classic and the most popular cut, princess cuts are a bit more modern with their squared-off edges but still elicit brilliance. Emerald and Asscher cuts remain reminiscent of their vintage pasts and feature step-cut facets that allow you to see through the stone. Cushion, or pillow, cuts also throwback to the past but hold a unique depth that mixes vintage flair with modern muse. Elegant, beautiful and classic, this 0.75 carat round brilliant diamond sparkles from within a four-prong white-gold mount hanging from a white-gold cable link chain. Pair with a cashmere sweater for preppy perfection during the workday. For errands on-the-go, layer with a longer statement necklace and pair with a swingy shark-bite tunic, skinny jeans and moto boots for edgy attitude. Also available in many other carat weights, as well as yellow gold and platinum..
Ladies who veer from tradition and opt for more dramatic diamond cuts can choose a 0.75 carat princess cut pendant set in a white-gold and hung from a cable link chain. Or opt for another carat size in yellow gold or platinum. The contemporary cut of the princess diamond adds interest and pairs perfectly with suits for a modern appeal or with a simple shirtdress, leggings and over-the-knee suede boots. 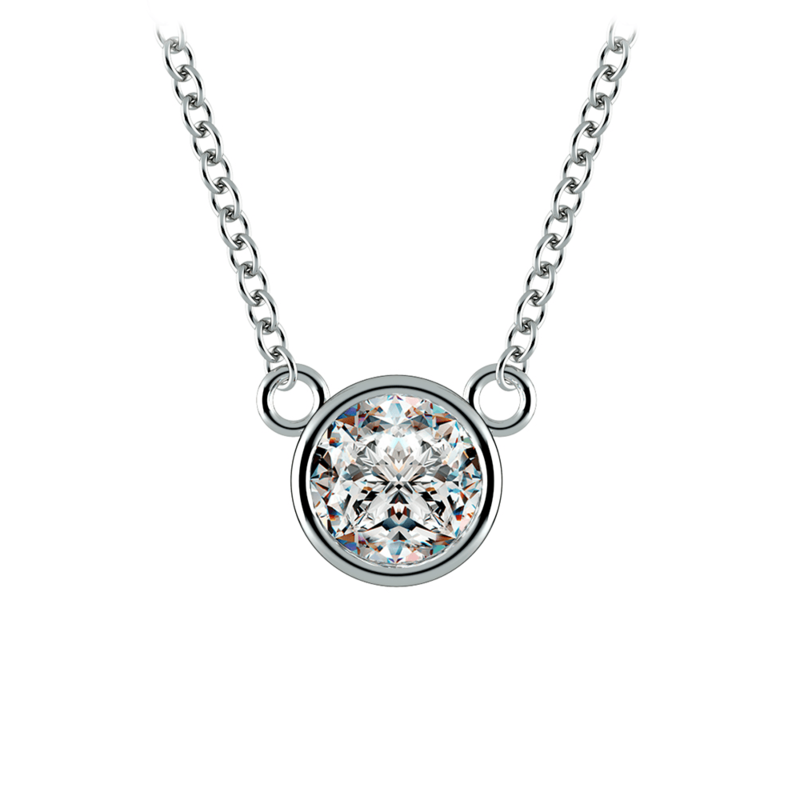 For a diamond kiss at the base of the throat, select a bezel set pendant. A 0.75 carat diamond seamlessly blends with the shiny bezel setting of white gold to create an eye-catching statement piece. Choose from a variety of other carat weights and metals, too. Pair pendants that hit at the base of the neck with tops that are cut to show off the neckline—like boatneck tops. Shorter pendants also look stunning with oxford shirts, which make the pendant a perfect choice for the office. 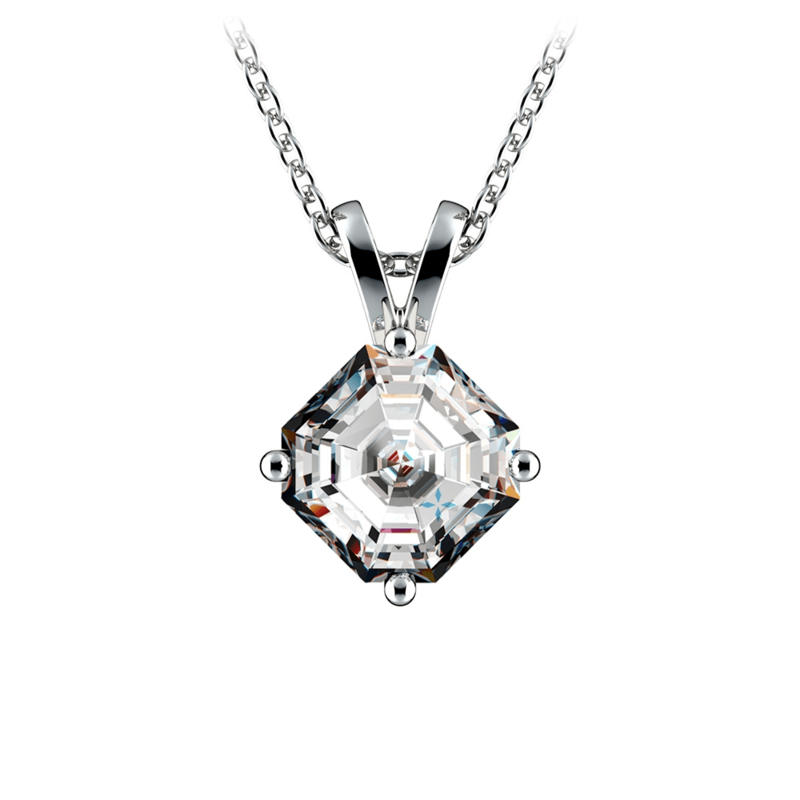 Asscher cut diamond pendants strung and hung from platinum exude sophistication and style. The step-cut Asscher is straight out of the Art Deco period and evokes images of Flappers, Sally Bowles and Jay Gatsby. The Asscher pendant is meant to be displayed, as Asscher cuts are hand cut pieces of art. 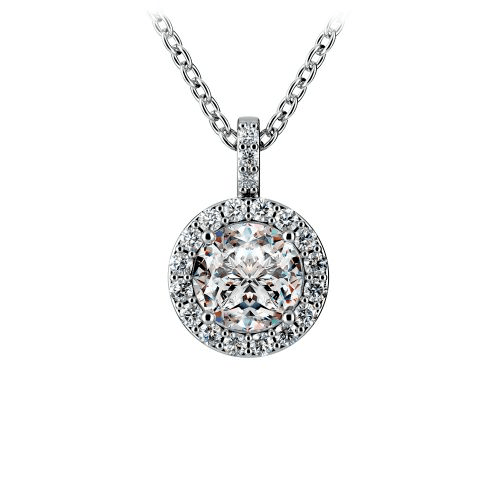 Pick the carat weight and metal of your choice, and pair this solitaire pendant with a little black dress or flowing silky tops in solid colors to reveal the beauty of the pendant. 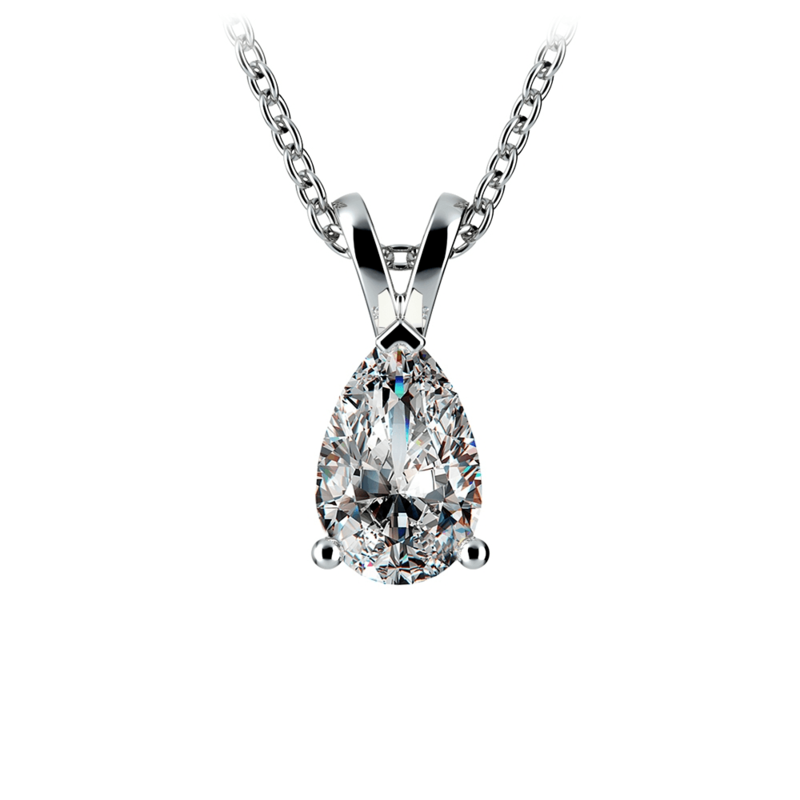 Like a sparkling tear drop falling onto the neck, the pear-shaped solitaire pendant holds a melancholy charm. The pear-shape of the cut can represent the tears of many emotions, especially joy. Wear the pear-shaped pendant to hold the memory of an event that has shaped the life—a birth, a marriage, or even a loved one lost. Pair the pear-shaped pendant with any outfit. Pick your carat weight and metal type, and dangle from turtlenecks, wear under t-shirts or showcase the pendant with sleek column dresses. When a solitaire simply isn’t enough fire, adorn a round brilliant diamond with a halo of smaller diamonds. Made in white gold, yellow gold, or platinum, the diamonds and design of this pendant capture chic contemporary class in a variety of sizes. 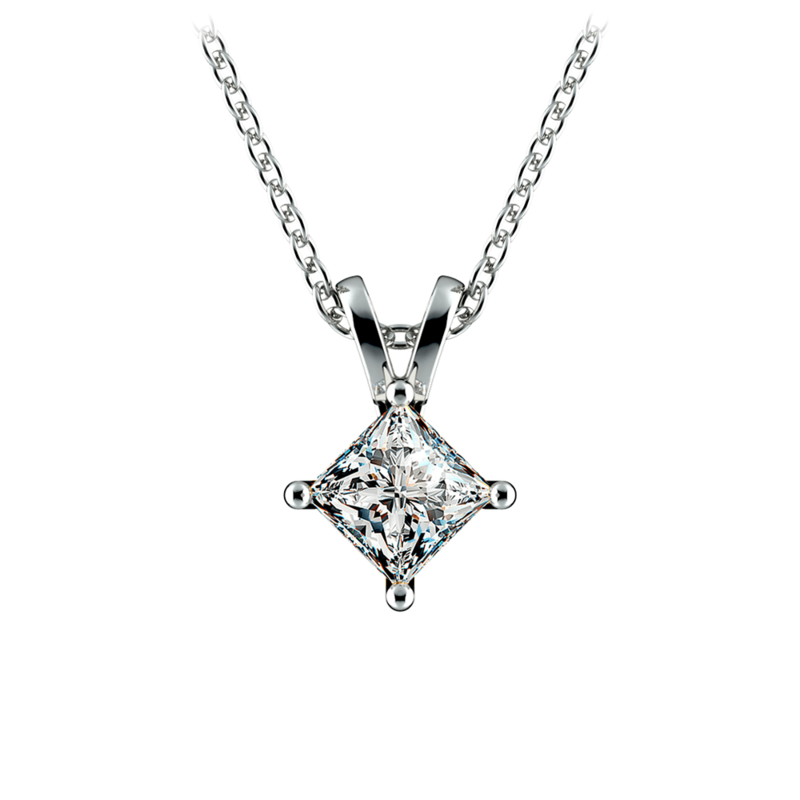 Like a simple solitaire, the halo pendant may be dressed down. However, do not overwhelm the pendant with large, statement jewelry. Opt for simple earrings in dainty stud designs and let the pendant take center stage. For feminine finesse, pair the pendant with flowing floral tops. Those who want to add contrast with the elegant pendant can pair it with a boho crushed velvet dress (in jewel tones) and add Dr. Martens for a 90s throwback. 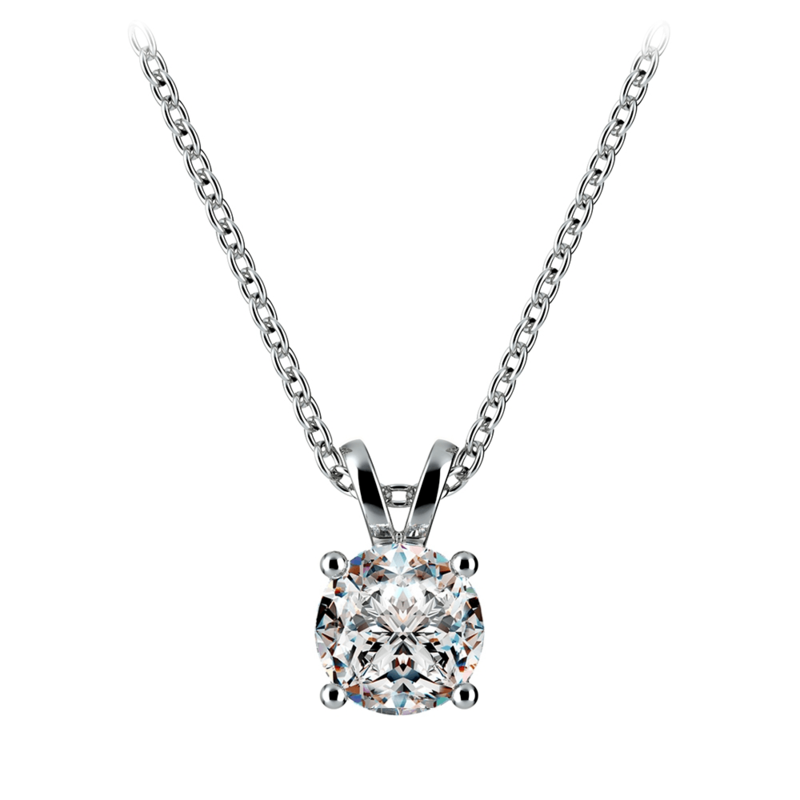 Diamond pendants are a must-have accessory in every woman’s jewelry box. Each woman has her own style, and pendant designs speak differently to each individual. Browse the full catalog at Brilliance.com, and select a diamond pendant that suits her style, her life, and her attitude and give her a piece of jewelry with everlasting Brilliance.